Thailand is the home of fabled palaces, giant golden Buddhas, and stunning temples. 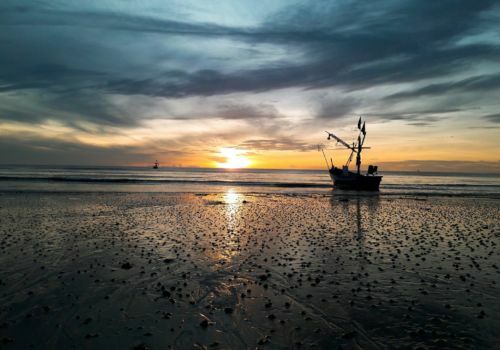 These cultural wonders are matched by its breathtaking natural beauty, with platinum beaches that have inspired authors and filmmakers alike. This itinerary will show you the best of an endlessly fascinating country. Spend the first day relaxing in your luxurious hotel. A trip to the spa will help you get over your jet lag. Tonight you’ll enjoy a reception on the Chao Phraya River and dine from a terrace overlooking the famous Wat Arun (Temple of Dawn) which lights up at night in golden splendour. You can do early morning yoga along the banks of the Chao Praya River if you’re up early enough. Then join in with a monk “alms” giving ceremony where we provide monks with gifts of food, a daily ritual repeated every day throughout Thailand. Explore the city’s waterways after breakfast. We then make a stop at one of Bangkok’s most striking landmarks – Wat Arun, also known as the Temple of Dawn. Next, Alight at Wat Kanlayanamit Temple Pier to be blessed for safe travels by the monks of the temple. Please note: Appropriate attire must be worn when visiting any religious place of interest. Short skirts, shorts and sleeveless attire are not permitted. Proceed to a restaurant for lunch before an afternoon visit to The Grand Palace. Here you will view the famous Emerald Buddha at Wat Phra Kaew. You will then will then be taken to see Wat Phra Kaew (also known as the Temple of the Emerald Buddha), a sacred temple which houses the elegant Emerald Buddha, Thailand’s most revered religious image. This will be followed by the Queen Sirikit Museum which showcases the Queen’s personally designed Pierre Balmain couture gowns. Return to your hotel by private vehicle in the afternoon. Today you’ll visit the Silom neighbourhood where street market stands sell freshly made dishes for approximately one US dollar each. You’ll then ride through the Chinatown district to reach a coconut ice cream shop set in a historic part of the old city, as well as visiting a famous mango and sticky rice shop that has been in operation since 1932. Next, we head to the 200-year-old Nanglerng Market, 27 acres worth of stalls where anything can be found. Return to your hotel once you have explored the market with your guide. Lunch will be served at a Michelin Star Street food experience. The rest of the afternoon will be spent at leisure in the hotel or the surrounding area. We then fly to Sukhothai, the first capital of Siam, now Thailand. You are transferred by a private air-conditioned vehicle to your hotel in the city. After checking in, either relax by the pool overlooking the majestic Khao Luang Mountain Range or enjoy a spa treatment at the hotel. Tonight, dine at a local restaurant offering regional specialities. 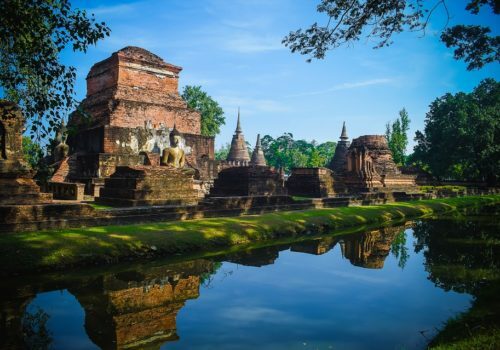 After breakfast, explore the UNESCO World Heritage Site of Sukhothai Historical Park by bike or electric car and see the great White Buddha of Wat Sri Chum. Enjoy lunch in a local restaurant, and then transfer to Thung Luang Pottery Village. This place had been famous for its handicraft community for over a century. Transfer back to your hotel by private vehicle after this engaging experience. Enjoy dinner at one of the best restaurants in the city in the evening. Today we visit the town of Lampang, an important centre of the international teak trade during the British Raj. 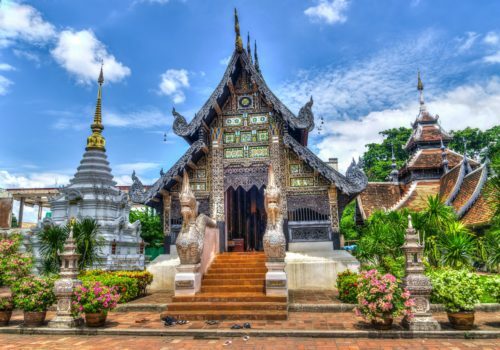 Visit a few of the most impressive temples in the area —Wat Phra, That Lampang Luang and Wat Phra Kaeo Don Tao, which once housed the sacred Emerald Buddha, now in Bangkok. Make a stop at Ban Sao Nak. This traditional Thai teak house is a mixed art of Burmese and Lanna styles. The house comprises the core building and satellite small houses with 116 supporting wooden posts. After the visit, you will continue driving to Chiang Mai. Founded in the 13th century, Chiang Mai has long played a role in Thai history and is a burgeoning economic centre. Take some time to relax and freshen up after checking into the hotel. Explore Mae Kampong Village in the morning, an ideal destination to experience the unspoiled beauty of nature. You will be welcomed by local villager upon your arrival. Then, you walk through the community forest, where the villagers grow tea and coffee, to see how they preserve their lands and live in harmony with nature. Stop at a picturesque waterfall on your way through the forest. Lunch will then be provided at a local restaurant. You can then enjoy a 2 hour massage before exploring the process by which tea leaves are fermented. In the late afternoon, enjoy preparing your dinner with local people in their house. Prepare a self-made feast under the direction of local villagers before a private vehicle transfers you back to your hotel. After breakfast at the hotel, we set off for Waroros Market by trishaw ride along the famous Tapae Road through the ancient city walls and along Rajdamnern Road to Wat Phra Singh. Arrive at Wat Phra That Doi Suthep, which rests on Doi Suthep Mountain. Climb the 309 steps to reach the temple, or simply use the tram. As well as some striking examples of architecture, Wat Phra That Doi Suthep also offers exceptional views over Chiang Mai. Continue by private vehicle to Patara Elephant Farm to experience an unforgettable day with the elephants. You’ll then transfer back to your hotel by private vehicle. Optional Dinner: enjoy the finest French Cuisine in the Best French Restaurant Awarded by Thailand Tatler Magazine for the Ten consecutive years. After checking out of the hotel, you be will met by a guide and transferred to the airport in time for your onward flight to Koh Samui. Upon arrival at Koh Samui, a local guide and driver will collect you from the airport and take you to the hotel. Optional activity: Tamarind Springs is Koh Samui’s first dedicated day spa, and one of Asia’s most acclaimed spas. After breakfast, enjoy yoga at the hotel. Then, spend a day at leisure, or explore Angthong National Marine Park. Finally, indulge in a farewell meal and drinks. After checking out of the hotel, you be will met by a guide and transferred to the airport in time for your onward flight home.